Originally posted: May 31, 2017 . Last modified: March 20, 2019 . Treat yourself to our vanilla cake donuts with fudgy Nutella glaze for a decadent, sweet treat. 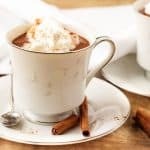 It’s perfect for breakfast or dessert! Cake donuts have always been a guilty pleasure of mine. They are dense, flavorful, and not overly sweet. While they are usually served with a simple glaze, Kim decided to take her version up to a new level. She originally got the idea to make cake donuts from another blogger. 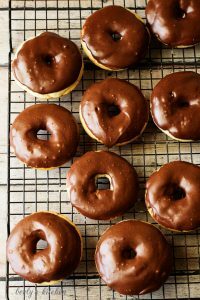 The Domestic Rebel has a delicious and straightforward cake donut recipe that Kim adapted for our post. The original recipe can be found by clicking this link. I encourage you to check the website because there are a lot of great dishes! I am not sure why Kim decided to use Nutella in the glaze, but I am glad she did. 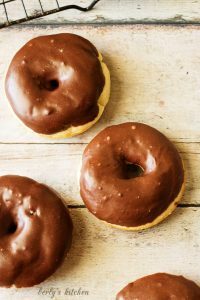 The chocolate fudge and hazelnut combination works perfectly on the somewhat tart donuts. Furthermore, the glaze is not quite as sweet as it appears. Don’t get me wrong; it’s rich but not as overwhelming as something you would get at your local grocery store. Density is important when it comes to cake donuts, and this dough delivers. I am not going to get into the instructions here because they are already listed on the recipe card. However, I will offer a few tips. Try not to substitute buttermilk for milk. Kim tried that on the first batch and they stuck to the pan and crumbled apart. We are not exactly sure why that happened, but we suspected the liquid swap. Types of liquid and batter thickness can have an impact on this recipe. Similar to our breakfast tacos, you don’t want the batter to be too thick. Otherwise, it won’t cook up properly. Additionally, a pastry bag isn’t necessary for the recipe. If you have a large Ziplock bag, then put the dough into it and slice off one tip to make a bag. Also, you could use a cupcake decorator as Kim used. It works really well. That’s about all there is to it. The main thing to remember is if things don’t work the first time, try again. As always, I wish everyone a long life, love everlasting, and a full tummy! Looking for another decadent sweet treat? Then check out our Brownie Mix Turtle Brownies! Treat yourself to our vanilla cake donuts with fudgy Nutella glaze for a decadent, sweet treat. It's perfect for breakfast or dessert! First, preheat oven to 350 degrees F.
Next, grease donut pan(s) with non-stick cooking spray. After that, combine both flours, granulated sugar, baking powder, salt, and baking soda in a large bowl. Whisk all the ingredients together. Then, add the butter to the bowl using a pastry cutter. The mixture should look like grainy sand. Afterward, in a separate bowl, whisk the eggs until they are frothy and then add the sour cream and vanilla. Stir everything together to make sure they are smooth and creamy. Now, mix the wet and dry ingredients together to create the dough. Lastly, put the dough into a pastry bag and fill the donut pan(s) with the batter. Each donut should be filled 2/3 full so that they can rise properly. Bake them for about 10 to 15 minutes. Remove the pan(s) from the oven so they can cool off before you glaze the donuts. First, in a small bowl, sift together the powdered sugar and cocoa powder to remove any lumps. Next, in a separate small bowl, warm the Nutella in the microwave for 10-15 seconds on high (just enough to make it easier to stir). Now, combine the powdered sugar, cocoa, Nutella and milk and stir them together. If the glaze is too thick, add additional milk (1 teaspoon at a time). However, if the mixture is too thin, then add extra powdered sugar (1 teaspoon at a time). 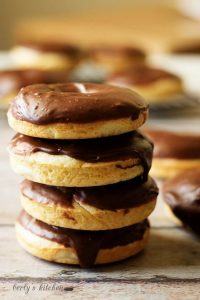 Last, dip the top of one donut into the glaze and let the excess drip off. You can place on a cooling rack to set. Continue the process with the remaining donuts. The calorie count listed is an approximation based on the listed ingredients. The prep time includes the time needed for the donuts to cool before adding the glaze. This recipe makes about 12 donuts. You can store donuts in an airtight container for up to 3 days. The recipe was adapted from another blogger's website listed here. OMG, these look delicious!! I just Yummed it. Those look so good! I keep saying I need to buy one of those donut pans but I still don’t have one. 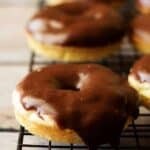 And then I see a recipe like this with nutella glaze. Yum! I need to buy a donut pan! This looks heavenly! I would love a plate of these and some milk on a saturday morning! Donuts are my FAVORITE! This seems like the perfect way to try nuetella. I have never had it. Oh my word! Looks fantastic. I’m always on the lookout for baked donut recipes. I love doughnuts! I can’t imagine how good these would be with nutella. These look amazing! I live anything involving Nutella! 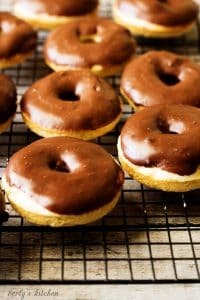 I finally got to make this vanilla cake donuts fudgy nutella glaze this past weekend and it was such a hit!! Thx for sharing Kimberly! Can i post it on my blog? Hi Jill! We’re so glad you liked the donuts! 🙂 Thanks for asking if you can post the recipe on your site. Unfortunately, we don’t allow our recipes/photos to be reposted. However, some people have recreated our recipes in their own words, taken original photos, and provided a link back to the original recipe. 🙂 Hope all that makes sense. Thanks again and have a great day! 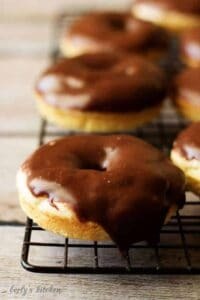 This vanilla cake donuts fudgy nutella glaze looks absolutely fantastic. Beautiful photos too. Thanks for sharing!